The growing trend with many photographers is the desire to take their studio lights with them on location. We are seeing more and more portable studio lights, offering quick setup and loads of power for location shoots. It’s time there were modifiers to match. The Interfit Line of Foldable Softboxes combines the large sizes that studio photographers have grown accustomed to with the quick setup and portability that location photographers require. Featuring an internal frame of interlocking fiberglass rods that easily snap into place, we have eliminated the worry of misplacing a heavy steel rod and the struggle one can have while setting up a large softbox. 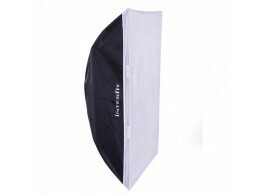 Each Foldable Softbox is lined with a dimpled silver interior for maximum light distribution throughout the box. This ensures even illumination from corner to corner. Included with each softbox are two removable diffusers to create a softer quality of light, and a drawstring nylon carry bag, letting you easily transport your softbox wherever your work takes you.